Every year we try and pick a theme for the kids. 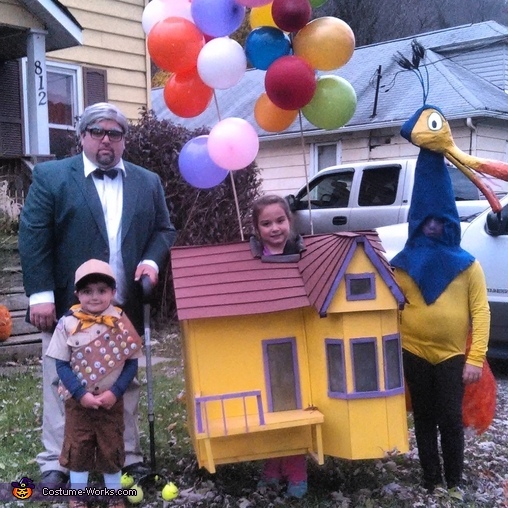 This year dad was included :) We love the movie Up so that was our inspiration. My husband built the house from wood (not suggested because it was heavy) and painted it to look like the movie house. My daughter Olivia carried it on her shoulders from the inside and we connected the balloons with wooden dowels. Her twin sister was Kevin the bird. The head is made from pool noodles and newspaper and painted to look as close as possible. The neck and hind quarters are constructed of chicken wire and covered with fabric.